How's this sound: 21 original stories from various authors about extraterrestrials, conspiracies, and space exploration, full of moments that will make you gasp, shudder, laugh, and wonder? Irresistible, right? The last of my Captain Quasar short stories, "Captain Bartholomew Quasar and the Devious Powers of Persuasion," appears in this new anthology from Geminid Press and marks the first time Quasar has earned himself professional rates. About time he started pulling his weight! "We have an intruder on board, Captain." "Really?" He broke from staring vacantly out the viewport, which is what he did anytime he was in the conference room. His crew might have thought he looked pensive—or so he hoped—but in actuality, he was, to quote an ancient Earth phrase, spacing out. "Wouldn't the ship's computer have notified us if such were the case?" "According to the latest duty roster, she is a member of the crew." "She?" Quasar raised an intrigued eyebrow. "Our communications officer on the bridge. A Lieutenant Jones, sir." Quasar's eyebrow sank, wrinkling toward its counterpart. "We don't have a communications officer named Lieutenant Jones." 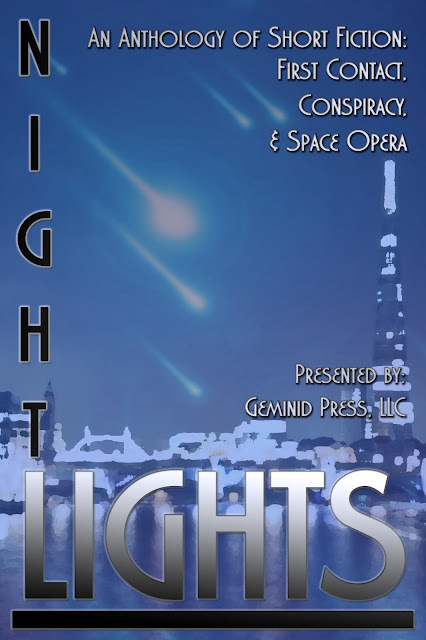 Check out all 21 tales in Night Lights, now available.